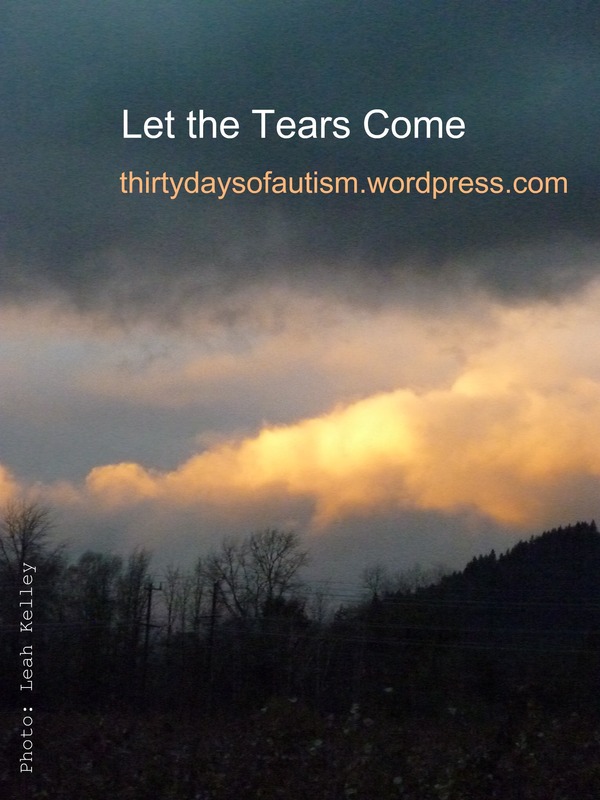 Today I am thinking about another Mom of a child with autism who is facing some very difficult challenges: gut-wrenching, soul-tearing, strength-testing, heart-breaking decisions that will likely make life better for her beautiful son, and her family, and herself. I am thinking that as parents of these wonderful and challenging boys, it usually benefits us to be so very strong and in control of ourselves. We also work hard to control the environment for our guys: to help regulate the way the world comes at them so unevenly, and we are there to help mitigate their response. We work out difficulties we encounter with that way of researching, learning more, advocating, making another call, another connection, another decision, another plan to make things better… Most of the time our amazing strength, our focus, intelligence, drive, work ethic, and extreme self-control help us make it through the day. Letting go… is a metaphor on a number of levels. Letting go of Nika and my assumptions that she was best off living with me. Letting go of my guilt and negative feelings about this. Letting go of my logical stance that this is the best for her and in doing so denying my own feelings and letting go of my rigid self-control to allow myself to experience the grief I am feeling. I also have to let go of my anger, stress, and anxiety. The paradox is that in order to let them go… I have to experience them, not simply deny them. These feelings exist and are valid, even thought they are unproductive and unhelpful (red thoughts) and I don’t want to be wallowing in them. Denying these feelings is hurting me physically; I have pain in my chest and in my stressed out tightly clenched jaw. I have been surprised at my feelings of anger lately. I usually pride myself on not getting angry. But I have been so mad about so many things. It is the quickest feeling to come to me. It is very uncomfortable. I don’t like it. I don’t like what it says about me as a person and I don’t like the feeling, and I don’t like the sense of not being in control. So here is another paradox. The more I have tried to control this process for myself, and remain in the logic zone where I know this is the best decision for my daughter, the less control I have actually had over my emotions. If you don’t let out grief and hurt and pain and fear…it comes out as anger…. or it seems to leak out when you least expect it. I have been crying so much in the past few days. I feel lost… but I am finding my way. The tears are draining, but some of the stress drains with them. Holding onto everything doesn’t allow the processing. Pain and sorrow and fear are washing over me more readily than anger now… and I have to let go and let it just come as it will. It is very interesting indeed, that I know what is best practice for others, and yet I hold myself up to an almost unattainable standard that is way beyond what I would reasonably expect of someone else. I have a huge double standard. I am way harder on myself than I would be on others, and I suspect I am not alone in this tendency. As a parent of a special needs child, just like City Mouse’s Mom, I am used to holding it together so often, and am typically operating at a level of stress that most people would encounter only occasionally. I am used to keeping it together and managing my emotional responses, and I am braced for the unexpected – because it is not so unexpected, and I can’t afford to be blind-sided. When things are going well – I enjoy it to its fullest. I realize that this may be a short-lived experience, and there is likely something more to overcome around the next corner. When the going is good… enjoy; when it’s tough… it means there is work to be done!!! I wash my life with a layer of calm – and sometimes it is a facade – but most of the time it has just become the way to handle life. It is a fairly effective technique… extreme self-control. However, when something comes along that shakes me to the core… like Nika moving in with her dad (or for my good friend – a death in her family), I automatically react in the same way. I manage myself, I control it all, keep it together…. and it can’t work this way at these times. It seems that it is natural for us, City Mouse’s Mom and me, to have trouble expressing our pain and grief. We survive by being amazingly strong and tough and logical and calm, and incredibly well spoken and smart… and unfortunately none of this helps a lick when dealing with pain. This entry was posted in Aspergers, Autism, Grief, Tears and tagged anger, Autism, city mouse, City Mouse's Mom, control, double standard, extreme self-control, Giving up control, grief, letting go, pain, paradox, parents, processing, stressed, tears, unattainable, unexpected. Bookmark the permalink. Wow, Leah. You really *do* get it. And you express it all so beautifully. I almost never have time to visit other blogs but I think from now on I’ll try hard to be reading yours. Your prose is like poetry – and you feel like a kindred spirit. Thank you for giving voice to an intelligent, honest, heart-wrenching perspective that I appreciate. Sometimes what makes me hold on is the knowing I am far from alone. Thank you for your comment. I know what you mean about feeling nothing… I have been there! I will have to pop over and see your post… you have me very curious. Hugs to you! !